Has anyone added a staysail to their 365 ketch, to make it a cutter ketch? And/or other additional sails like a ballooner, mizzen staysail, or fisherman's sail? Anybody out there these days? I thought Dale did that to his 365. There is a section on this site about his boat. I have a 367 cutter. 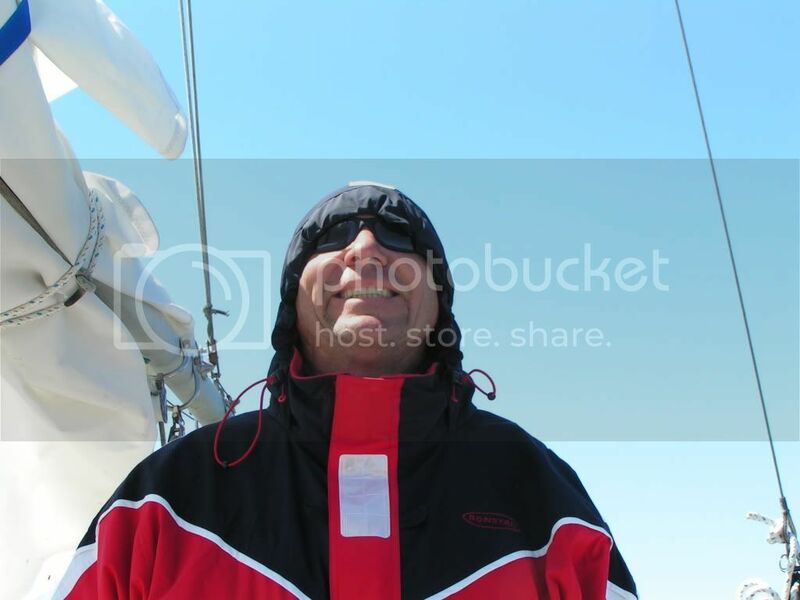 The sailmaker tried to convince me to ditch the staysail and go with a genoa but I stuck with the cutter rig and bought new head sails last year and the main the year before. The previous owner used it as a sloop but I had tennis elbow from cranking that sucker. My choices were to go with the cutter rig or get bigger winches. I like the flexibility of the cutter rig. The 367's mast is 1.5ft aft of the 365 mast for more room for the staysail. BTW, my old sails may have been the original. Hood said they hadn't done that type of stitching in 25 years. The speed increase, pointing ability, and less heeling are incredible. Thanks Mike! I will have to take a look and see what Dale has posted on it. How is yours rigged up to the deck? And do you use a furler or hank on? I was thinking of maybe going with a hank on, and using dynema as the standing stay for the staysail. The 367 has a removable stay. There is hardware on the deck to clamp it tight and below the deck, in the chain locker, there is a cable the goes from the bottom of the deck to the hull at the bow to take the stress. There is also a boom that attaches to the deck and a traveler. There are also running backstays. My staysail is hanked on. Thanks for the help! How many feet are between the staysail and headsail? Im still trying to figure out weather or not to put the extra stay on; especially for an easy way to hank on my storm jib. 45" between headstay chainplate and staysail stay deck plate on my 367. Thanks for posting your measurements! I'm interested in making the same modification. However I'm not sure if it makes sense to place the inner forestay the same 45" back from the headstay, given the different position and height of the mast. For the 365 conversion, do you think you would make any adjustments to that measurement? If you keep the same measurement, the foresail will be smaller than on the 367. I did some calculations using I and J values from sailboatdata.com. With a 45" offset for the inner forestay, the 367 inner foretriangle is 212 sqft which is 60% the foretriangle area. If you use the same offset on the 365, the inner foretriangle is 56% of the foretriangle area, which I suppose is pretty close. Sounds good for a heavy-weather rig I suppose. Nereid, have you done any further work on this project? What are you doing about sheeting? Running backstays? Will your staysail have a boom? I have a ketch with the factory self tending inner staysail. I read your post a while ago but have been very busy as of late moving out of our home of 36 years. But today is your lucky day! I also have all of my standing rigging laying here so I can tell you the inner forestay dimension, check stay dimensions and so forth. It is an excellent addition to your sail plan offering many more combinations and options when the wind heads up or down. I sail with my staysail up pretty much all the time. I roll the 130% head sail when we reach 16 or so knots. I have not had a chance to work on it yet (it is still a little down the road).. apparently a working head and shower take precedence but I will be getting to it in the next couple months unless we head out to go cruising..
How is yours rigged up to the deck? Do you use a furler or hank on? As well as the distance from the forestay to foot of stay and from mast head to stay (or just the length will do). Also, i'm not sure about doing a running back stay.. We have a couple sizes up standing rig and chain plates so it should handle the load.. plus I wouldn't use both in heavy wind. Like I mentioned, I have the factory self tending inner stay sail. There is an inner head stay tack fitting. I use a quick release lever so I can stow the inner stay if required. Below deck, hooked to the underside of the tack fitting, is a turn buckle that attaches it to the base of the anchor locker so all of the load is transferred to the bow section of the hull, nothing in terms of up load to the fore deck. Aft of that is the pedestal for the self tending boom just like on a 367. The check stays are not designed to give the standing rigging the ability to carry the load, rather they are designed to keep the mast from bending forward and are attached directly where the inner fore stay attaches up top. The stay sail itself is hanked onto the inner fore stay. There is a short traveler section to control the trim of the stay sail boom. Here are some documents about staysails and sheeting them. I have 367. A PO removed the club, but did not install tracks for the correct sheeting angle. I added a 4' piece of track on both sides of the coach roof for the correct sheeting angle. Read the attached documents and you'll get a better understanding of the where to put the sheet leads (fore/aft and athwartship placement) to trim the sail properly. One of the documents has info about staysail size and angle of the head of the sail. Attached are pictures of my staysail sheet lead tracks. The sheets head aft from the track to cabin-top winches (port and stbd, not shown in pictures). I don't remember from where I obtained the following information, so I can't cite the sources. I do know I didn't make it up; I read it somewhere. 3. bisect that new angle, this is the sheet angle. Tracks angled about 15 degrees from center (closer to center at fwd end, farther from center at after end. Idea the behind angled track: when wind pipes up, ease the car back to give leach twist to spill he wind. move the car fwd and it flattens the leach and directs higher velocity to the lee of the main, giving main more lift.